Joseph H. Dalmus, The Prosecution of John Wyclyf (Yale University Press, New Haven, 1952) The author’s original research gives a fresh perspective on key events, personalities, and controversies in the life of John Wycliffe. Very little on Wycliffe’s translating the Bible. Anne Hudson, ed., English Wycliffite Sermons (Clarendon Press, Oxford, 1983) This is the first of four volumes presenting sermons attributed to John Wycliffe and appearing in the original Midland English dialect in which Wycliffe wrote. Recommended for scholarly study. 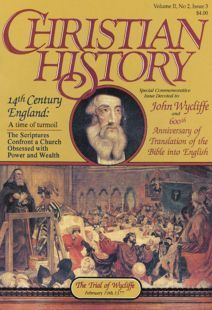 K. B. McFarlane, John Wycliffe and the Beginnings of English Nonconformity (English Universities Press Ltd. at St. Paul’s House, London, 1952) This brief but respectable biography discusses the early Protestant awakenings in England through the biography of John Wycliffe. George M. Trevelyan, England in the Age of Wycliffe (AMS Press, 1975, reprint of 1900 London edition) Author describes many aspects of life in 14th Century England and how Wycliffe influenced, and was influenced by, his times. Margaret Deanesly, The Lollard Bible (And Other Medieval Biblical Versions) (Cambridge University Press, 1920, 1966) This classic work in the historical background of the English Bible sets the religious, academic and social scene. G. H. W. Parker, The Morning Star (Wycliffe and the Dawn of the Reformation) (Eerdmans, Grand Rapids, Mich., 1965) A study of the mid-14th Century church, including Wycliffe, John Hus, and other leaders in the pre-Reformation era. John Stacey, John Wyclif (AMS Press, 1979, reprint of 1964 edition by Westminster Press) A fairly recent, readable and recommendable biography of Wycliffe. Matthew Spinka, ed., Advocates of Reform (Westminster Press, 1953) The part of this book devoted to Wycliffe includes a brief biography, plus two of Wycliffe’s significant works, "On the Pastoral Office" and "The Eucharist," translated into modern English. Gotthard Lechler, John Wycliffe and His English Precursors (AMS Press reprint of 1884 English edition). A definitive work on the life and thought of Wycliffe. Dated, scholarly, but good. Herbert Workman, John Wyclif, A Study of the English Medieval Church (2 vols.) (Shoe String, 1966, reprint of Clarendon Press edition, Oxford, 1926) A classic work, often quoted, as well as challenged, with emphasis on Wycliffe’s attitude toward the Scripture. Douglas Wood, The Evangelical Doctor (Evangelical Press, England) Publication date not announced yet. Our editors found manuscript progress most readable and thoughtful. Chaucer’s Canterbury Tales has a parson drawn from Wycliffe’s Lollards. The 500th anniversary year of the birth of Ulrich Zwingli is a good time to take a new look at the Zurich reformer. Interesting facts about Zwingli and Zurich.